Augusta Ada Byron, daughter of the poet Lord Byron, was born on December 10, 1815, in London. Her parents separated when she was a month old and Lord Byron left England. Ada, as she was known, was educated privately. Her abilities in mathematics were so great that at 15 she began working with the mathematician and logician Augustus De Morgan. In 1833 Ada first saw plans for Charles Babbage’s “Difference Engine,” a machine intended to automate the calculation of astronomical tables. Impressed by the machine and its possibilities, she began an association with Babbage. She also began corresponding with other scientists and mathematicians such as MICHAEL FARADAY and Babbage’s friend from Cambridge, the astronomer Sir John Herschel. Ada married Lord King in 1835. Three years later he was elevated to an earl, and Ada was afterwards known as Lady Lovelace. While Babbage was in Turin, Italy, he gave a series of talks on the successor to his difference machine, the Analytical Engine, considered to be the first automatic calculator in the world. General Luigi Menabrea reported on Babbage’s new invention in Italian in 1842. Lady Lovelace decided to translate this into English, and Babbage suggested that she supplement the translation with her own notes. Her notes more than tripled the length of the original text and added a great deal of insight, information, and clarity. Lady Lovelace had never been healthy. She died on November 27, 1852, in London at age 36, the same age at which her father had died. Lady Lovelace is considered to be the first computer programmer, her explanation and elaboration of the Analytical Engine left a legacy for computer designers in the twentieth century. While Lovelace did not design the Analytical Engine, her understanding of it and her collaboration with Babbage on programming it allowed her to explain what it was capable of and how it accomplished its work. In preserving and explicating this crucial step in computer history, she offered engineers in the twentieth century a grasp of the possibilities seen by Babbage. Babbage’s vision for his computing machine far outdistanced the technological capacity of his times. In the middle of the twentieth century, when technology caught up with the Analytical Engine, Lovelace’s documentation—as well as Babbage’s own notes—allowed engineers to incorporate his ideas into their new designs. HOWARD AIKEN, for example, referred to the Analytical Engine in developing the Mark I, the first full­ scale programmable computer in the United States, in 1944. His machine adapted the punch card idea developed and explained by Babbage and Lovelace. 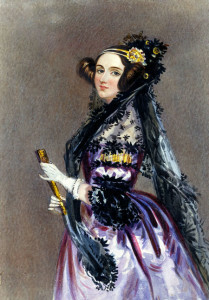 Lovelace originated the concept of modern computer programming. She explained that you could use a sequence of expressions on punch cards repeatedly, just as a subroutine in computer programming does today. Instructions fed into computer via punch cards, punched paper tape, and punched movie film were used in the earliest computers. In recognition of Lovelace as the first computer programmer, the Pentagon named a computer language, called Ada, after her in the late 1970s. Much of the work contracted by the United States Navy in the 1980s and 1990s was written in Ada. Posted on March 9, 2015 by Natalie. This entry was posted in Programmers. Bookmark the permalink.